Our second series, the desk Kanzler, merges modern architectural design with functional minimalism. Brilliantly conceived and carefully constructed compartments are artfully masked by a sleek and classic exterior. With built-in outlets and USB ports, the Kanzler successfully masters the art of practicality. The result is a most elegant and clutter-free workspace, where stationery, tools and technical devices are always within reach. Highly customizable, the Kanzler can be designed to suit your needs and complement your home or office. While our standard version is available in the dimensions 220 x 100 x 76 cm, custom measurements are available. For the construction of the body, you can choose between walnut, ash and oak. 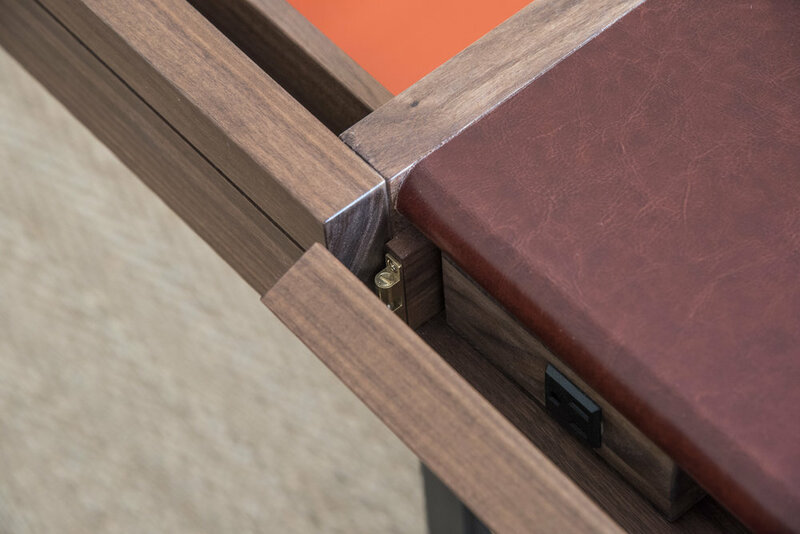 By selecting the type and color of the leather of both the interior and table top, your desk takes on a character of its own. The sturdy steel frame can be powder coated in the color of your choice.